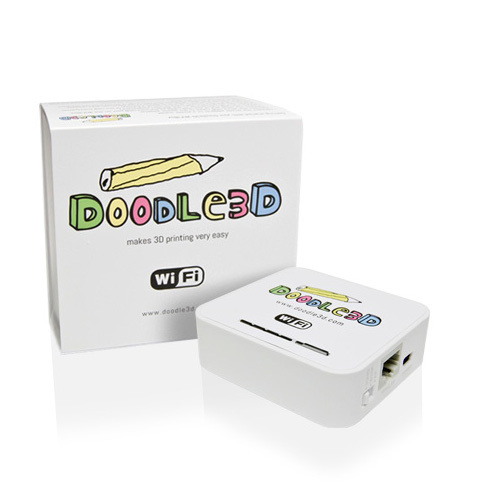 The Doodle3D app is a very simple drawing app running on the Doodle3D WiFi-Box. With Doodle3D you can draw something for a 3D-printer without knowledge of complicated 3D modelling programs. Doodle3D introduces you to the world of 3D printing! Make a drawing on your laptop, tablet or smartphone using the easy Doodle3D sketching app in your browser. It transforms your 2D drawing into a 3D model. When finished drawing just press ‘Print’. Your drawing is sent wirelessly to the WiFi-Box which controls your 3D-printer. After just a few minutes the 3D-printer is finished. Congratulations! You can now hold your 3D printed design in your hands! Simply connect the 3D-printer (see the list of supported printers below) to the USB port of the Doodle3D WiFi-Box, connect to the WiFi network and start sketching and printing in 3D directly from your web browser. Because it runs in a webbrowser it works on iOS, Android, Windows and Linux. Just connect to it through your browser. Make a sketch, change it to a 3D shape through the user-friendly interface and simply press Print. Your 3D-printer will immediately start printing your Doodle3D design. If you don’t have a 3D-printer yet you can take your Doodle3D WiFi Box and hook it up to a friend’s or Fablab or Makerspace 3D-printer and start printing as soon as you finish designing your doodle. No need to install any software applications or programs! Decorative art, make doodles for your Christmas tree come december! Go creative and design a bunch of your own alphabet letters or print a full font. And much more, it is up to you! The Doodle3D WiFi Box aims to connect any wireless drawing device to any 3D-printer. We will try to support as many different drawing devices (computers, laptops, tablets, smartphones) as well as many different 3D-printers. Which devices we manage to support depends on how open their format is. If you have an open-source 3D-printer we’re almost sure we can support your printer since we can find out how to communicate with it. If you own a commercial closed source printer it might be more difficult.